The Remonstrance was the official publication of the Massachusetts Association Opposed to the Further Extension of Suffrage to Women. 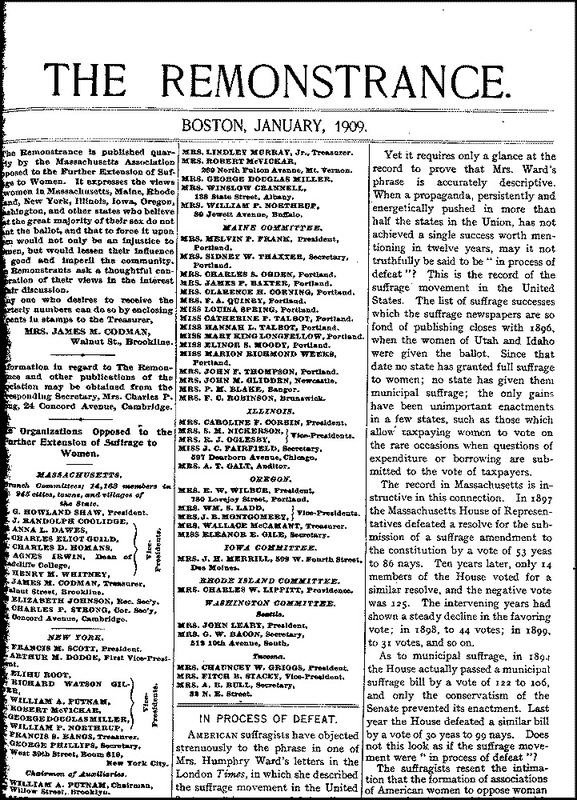 First published annually and later quarterly in Boston from February, 1890 until April 1919, it provided a forum for women who opposed the expansion of voting rights to women. Articles included discussions on state and municipal suffrage defeats, efforts to rescind suffrage in the Western states, the radical politics of suffrage, class distinctions between the suffrage and anti-suffrage movements, benefits of the woman’s place in home and the promotion of anti-feminism. Additional articles focused on the anti-suffrage movement in Great Britain and commentary on radical British Feminism and its effects on American women. While it would seem that most, if not all, women would be in favor of the right to vote, the women’s suffrage movement did not represent the wishes of all women in America. Some of the anti-suffrage leaders who took 1200 people up the Hudson for their Decoration Day picnic. 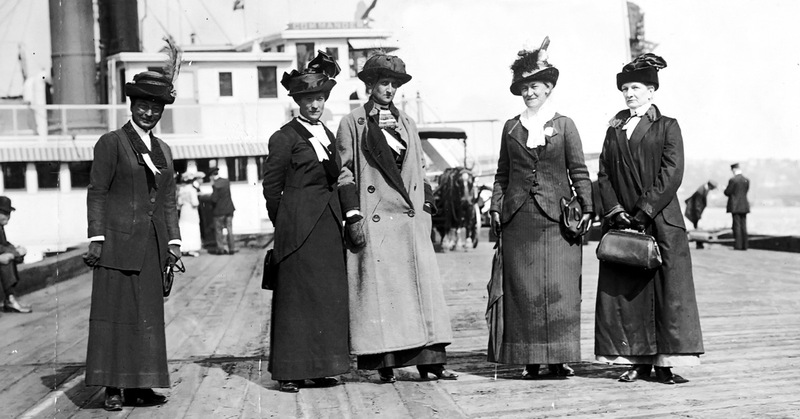 L to R: Mrs. George Phillips, Mrs. K. B. Lapham, Miss Burnham, Mrs. Everett P. Wheeler, Mrs. John A. Church. Scholarship has focused largely on the historical developments of the suffrage movement, with the presence of female opponents of suffrage and anti-suffragist organizations receiving less attention. These anti-suffragists were vocal in their opposition to the suffragists who represented a threat to their ideal of womanhood. While female suffragists largely ignored them at that time, it is important to acknowledge their presence in American history. Following the passage of the Nineteenth Amendment, the women within the anti-suffrage movement did not disappear, but instead organized themselves into a broad political movement that opposed expansion of social welfare programs, women’s peace efforts and feminism in general. This anti-feminist movement persisted throughout the 1920s, using its influence to try to halt what they saw as being subversive legislation, before largely disappearing by 1930.